One of the most important components of your gun cleaning kit is very rarely included in the package: a good gun cleaning cloth. Whether it’s to wipe up spilled solvent, apply oil to your external metal parts, or just to wipe away fingerprints, everybody has an absolute need for a good gun cleaning cloth. While it certainly is possible to get away with using old, worn-out clothing for your rags (I do it whenever possible) it is much nicer to purchase an actual gun cleaning rag. This will ensure that your rag is made of the exact material you want, and won’t leave any lint or dust behind. If you want to learn more about what makes the best gun cleaning cloth, then keep reading! For starters, we need to look at the differences between cloths and patches. Both will need to be very absorbent and durable. They will also need to be lint-free and not leave any dust or dirt particles behind. In fact, the only real difference between a cloth and a patch is going to be the size! The same things that make a good patch will also make a good cloth. In fact, most of my cleaning patches actually start out as cloths. This way I can just cut a piece of my cloth off whenever I need a patch. This doesn’t always work out with every cleaning cloth, but when it does it is especially handy. When it comes time to purchase the perfect cleaning cloth for you, there are a few things you will want to look for. For starters, you will want to select the perfect material. Cotton is obviously a good one, but many cloths elect to go the microfiber route. Many cleaning cloths are also impregnated with some sort of specialty cleaning chemical, usually silicone. While I generally prefer a plain old regular cloth, this is mostly up to your personal preference and what type of cleaning you will be doing. Whatever route you go, you will want to make sure you get something that is durable, absorbent, and lint free. The first thing to consider is going to be the material. Gun cleaning cloths are made primarily of 2 materials: Cotton, or microfiber. For starters, we’re going to look at cotton. This is mainly personal preference, but I much prefer cotton over microfiber. For some reason, I feel like cotton rags are much more absorbent and get my guns much cleaner. Cotton is much more absorbent and easy to use, and more durable as well. It is also much easier to cut your cotton cloth up into patches. Cotton is not without its downsides, however. Cotton rags can be cleaned and re-used, but not nearly as easily as microfiber. Cotton cleaning cloths are more of a “one and done” type of rag. Microfiber, on the other hand, is quite a bit more expensive but can be easily washed and reused. In my opinion, that is about the extent of the benefits to microfiber cloths. They have a tendency to smear things around instead of absorbing them and aren’t very good at removing things like fingerprints or excess oil. For these reasons, I tend to ignore them, but they certainly do have their place in the gun cleaning market. When it comes to gun cleaning cloths, you will see a lot of options out there that have been treated with silicone. This is a popular option due to its corrosion resistant properties. The only issue with this is that the treatments don’t last forever, and it makes the rags much less absorbent. It’s kind of hard for a cloth to absorb excess oil and solvent when it’s already full of silicone! These kind of rags are fantastic for storage, wiping away fingerprints, or giving your firearm a final wipe-down before putting them back in the safe. But if you try to cut one of these up into patches or use it to soak up solvent, you’re going to have a bad time. Overall, gun cleaning cloths are pretty simple, and much of your decision will be based on personal preference. Even though I like the basic, cheap cotton rags, I know many people who prefer the fancy treated or microfiber cloths. At the end of the day, as long as you get something absorbent, durable, and lint-free, you will be more than happy with your purchase. An additional thing to consider is that cleaning cloths are still pretty cheap, so getting a couple different kinds will help make sure you find whichever one you like the best. If you know for sure that a microfiber cleaning cloth is for you, then you may want to give this Ultimate microfiber cloth assortment from The Rag Company a good look. This pack includes a wide variety of cloth sizes. 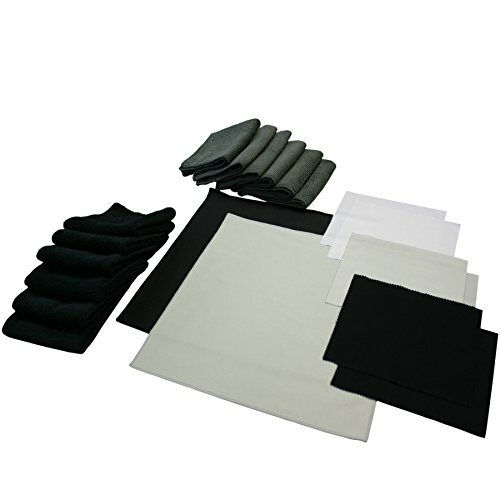 It includes half a dozen 6”x7” cloths in various colors which are great for cleaning off the lens of your scope or getting into hard to reach areas in your receiver. It also includes a dozen dark gray and black 10” square cloths. These are great for wiping down barrels and the outside of receivers. The kit is rounded out with 2 12” square cloths. These cleaning cloths are great for general purpose cleaning, or even using as a small mat to lay your parts out on. While this is one of the most expensive options, keep in mind that they are washable and reusable. You will end up paying a bit more up front, but if you are a fan of microfiber cloths, this could very well be the last gun cleaning cloth you have to buy. 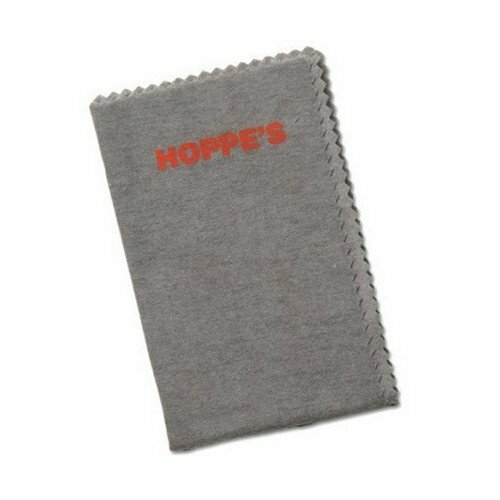 If you are looking for a silicone treated gun cleaning cloth that you can take anywhere, then this Hoppe cloth may be the one for you. This is the perfect cloth if you enjoy taking your old shotguns out upland bird hunting, as the old finishes are especially susceptible to corrosion from the elements and fingerprints. With a cloth like this, you can always make sure that you are ready to give your beautiful firearm a quick wipe down and apply a protective layer of silicone to ensure that it will stay in good condition. The two best things about this cloth is that it is small and absolutely soaked with silicone. In fact, some people actually complain about having to wash their hands after using it because there is so much silicone impregnated into the 100% cotton rag. This can be a bit messy, but overall it’s a very good thing. This may not be the best rag for cleaning at the bench or soaking up oil and gunk, but if you are looking for a good rag to protect your firearms at the range or in the field, then this is just about perfect. 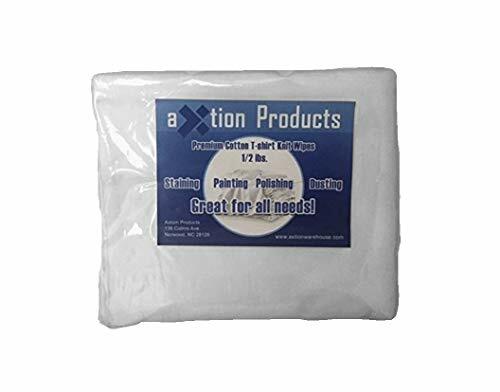 If you are really wanting a treated gun cleaning cloth, but don’t like using silicone, then this Remington product may be a good cleaning cloth for you to consider. This microfiber cloth is treated with RemOil (I know, we will get to that later) and measures 10 inches square. Since most treated cleaning cloths are made out of cotton, this adds another level of usefulness to this product. This is a great cloth for providing a final wipe down of your firearms before storage, but that is where its usefulness ends. RemOil, as many gun owners already know, is just about the worst lubricant that you can purchase. The only reason why I can recommend this product containing RemOil is that this is not designed to lubricate, only to protect. There are certainly better options for this out there, but if you insist on having a treated cloth that does not utilize silicone, then this is about the best you are going to get. 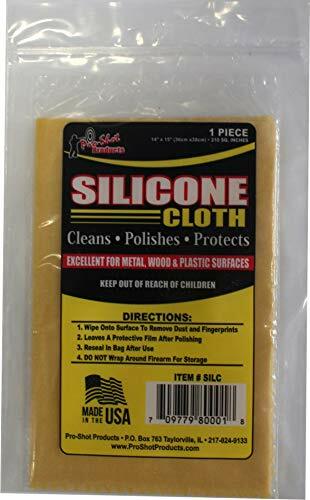 If you are looking for a nice-sized, silicone treated gun cloth that is perfect for giving your firearm that final wipe down at the bench, then this silicone treated cloth from Pro Shot Gun Care may be a good option. This 100% cotton cloth has been double treated with silicone to ensure that you will be able to use it for as long as possible. As with all treated cleaning cloths, this rag is not very absorbent, so it’s not very good for wiping away solvent or fouling. This is a fantastic product for protection, however. If you are looking for a larger rag to keep on your bench to give your firearms a final treatment before storage, then this may be a good product for you. If you are a basic guy who just wants to get his guns cleaned with no frills and no extra expense, then these basic cotton rags will do the trick. There’s really not much to these cleaning rags. They are 100% cotton, they work, and they are cheap. In fact, you can get an entire bag of these rags for just a few dollars more than a single treated gun cloth. The best part about these rags is, they make great patches too! While they aren’t quite as absorbent as I would like, they are the perfect combination of thin and durable that makes them fantastic to use as not only gun cleaning cloths but patches as well. Add in the fact that these are also great to keep handy around the house, and you’ve got a win-win! If you are looking for an affordable, no-frills product that will get your guns clean, then look no further! Protecting your investment in firearms is certainly nowhere near as easy as it sounds. Navigating the massive market of gun cleaning supplies is no easy task, and finding the perfect gun cleaning cloth for you is no exception. If you want the perfect gun cleaning cloth for your needs, you are going to need one that is absorbent, durable, and lint free. While all of the above options can certainly have their place on your bench, there is one that stands out far above the rest. The premium white cotton rags do everything you could ever want a gun cleaning cloth to do, and more. A clean, basic cotton cleaning cloth is the only thing I ever use on my bench, and I think that you will find that it will more than meet your needs as well. Now that you have all the information you need, it’s time to go out and buy the perfect gun cleaning cloth for you today!